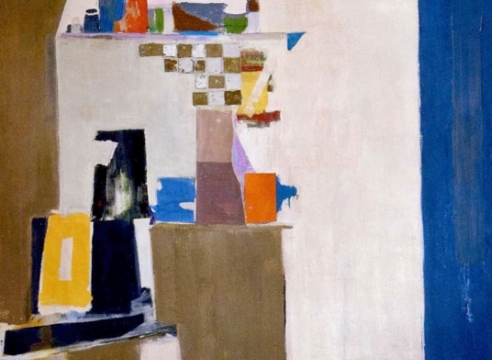 The Tibor de Nagy Gallery is pleased to present a selection of collages by the noted American artist Biala, who lived in Paris for over fifty years. This exhibition is the artist’s third with the gallery. The exhibition will comprise a group of image-based semi-abstract collages that were created from 1957 to 1963. During this period Biala’s intense focus on collage is particularly note worthy. The collages incorporate torn handmade paper, newsprint, and paint. A few of the pieces are oil paintings on canvas with collaged elements; others are collages on paper or un-stretched canvas. They vary in size from small to very large. The collages in the exhibition like the artist’s paintings, are inspired by images of her daily life including interiors with figures, landscapes, still-lifes and cityscapes. There is also a series of collages based on bird imagery. The works in the show, while clearly image-based, are often abstracted to varying degrees. The artist, whose painting career spanned most of the 20th Century, developed a style that was a synthesis of the intimacy and light often associated with early French Modernism, and a painterly directness and active brush strokes of Abstract Expressionism. 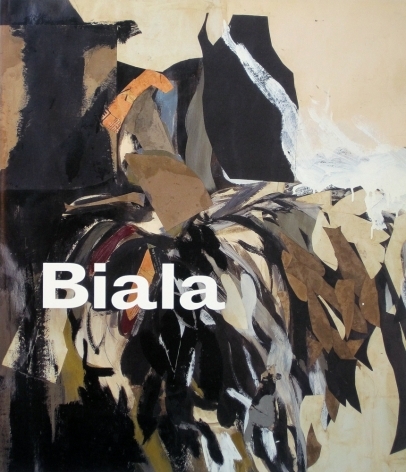 Biala didn't yield to abstraction. Things in the world—concrete objects we hold, traverse or trip over—were her art's impetus and end point. The ages-old endeavor of working from life puts Biala’s achievement at odds with prevailing notions of avant-gardism, of forward momentum and innovation. But looking at her pictures of unapologetic domesticity—Biala’s immediate surroundings served as inspiration—we wonder why the improbable marriage of de Kooning's hurly-burly and Edouard Vuillard's intimisme shouldn't, in and of itself, be considered radical. At the very least, it’s a tough row to hoe. The artist was born Janice Tworkovska in 1903 in the town of Bialystok, Poland. In 1913 she immigrated to the United States with her mother and brother, Jack Tworkov, the noted Abstract Expressionist. She began studying art with Edwin Dickinson at the National Academy of Design, and later, at the Art Student’s League. During the artist’s first visit to France in 1930 she met and became involved with influential British novelist Ford Madox Ford. They would remain companions until his death in 1939. During World War II she returns to New York and immerses herself in the art scene. She returns to live in Paris in 1947, with her husband Daniel ‘Alain’ Brustlein, an acclaimed cartoonist and accomplished painter. A select group of the artist’s later paintings will also be on view in the adjacent gallery space.